This rugged point-and-shoot model, priced at a competitive £349.99 in the UK and $349 in the US, follows in the footsteps of its brother the Canon PowerShot D10; one of the first to provide underwater shooting capabilities in the compact camera market. It is set to compete against the likes of the Panasonic FT4 and Fuji XP150. Expected not only to surpass the quantity and quality of technology fitted in its predecessor, the Canon PowerShot D20 has a wealth of added functions and settings that pitch it as one of the most feature-laden underwater shooters currently available. These features include a new underwater macro mode, Intelligent IS to keep photos and videos sharp throughout a range of shooting scenarios, a sensitivity range that reaches up to ISO 3200, plus increased video options that range from Full HD at 24fps to Super Slow Motion, ideal for documentary-style underwater shoots. Built with the adventure-seeker in mind, the camera is waterproof to a depth of 10m (33ft) or, coupled with the optional WP-DC45 waterproof case (which costs around £200/$350), shooters can plummet to 40m (130ft). It can withstand knocks and falls of 1.5m (5ft), is freeze-proof to -10C (14F) and provides protection against dust and debris. The GPS Logger tags images with location data, enabling you to track your shooting adventures using the supplied Map Utility software and Google Earth. It also carries a bevy of pre- and post-shoot photo effects, a Movie Digest creator, Smart Auto, with 32 scene options for capturing photos and 21 for movie making. One word that sums up the look and feel of the Canon PowerShot D20 is 'rugged'. Portability, and debatably aesthetics, are sacrificed to facilitate a more robust build quality. The unit is flatter than the bubble-like build of its predecessor, resembling an everyday compact camera, with one notable design alteration; it dons an undulating curve along one side, perhaps resembling a fish tail or even shark bite, to keep with the aquatic theme. The camera feels reassuringly heavyweight in the palm, with strong airtight seals protecting the camera's innards. The camera's menus are delivered logically, with nothing unordinary presenting itself. On the whole, the buttons are presented in a sensible layout, but some may argue that the thumb pad wastes valuable retail space on the rear, and the shutter's position between the on/off switch and the playback mode could lead to confusion. What is more, unlike the PowerShot D10's central lens position, the Canon PowerShot D20's design sees the lens wedged at the top-left of camera, making it trickier to compose shots. In fact most of the images gained during our review were taken one-handed. 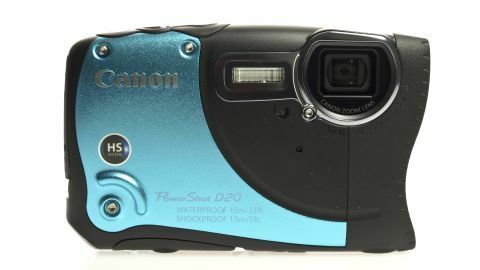 This may be viable for most shooting scenarios, but in situations such as underwater or in low light environments, handling the Canon PowerShot D20 may become more difficult. What's more, photographers can only tie the wrist strap to the left-hand side, which can be restrictive. This is especially disappointing for those upgrading from its underwater predecessor, who were offered the choice of four ports. The camera also lacks a framing grid, which may hamper some users when composing frames. Handling the camera isn't as smooth sailing as is often experienced with Canon's fleet of cameras, most notably due to a slow and sluggish performance. In most situations autofocus copes well, but in low light situations, the autofocus really struggles and often refuses to shoot without flash, which is altogether weaker than expected. The recycle time between shots is incredibly long, and waiting to change functions between shots is equally drawn out. We found the only way to focus on a subject is to depress the shutter fully, then to hold for another second or so for the shot to fire. There is then another delay of a few seconds while each image is written. As a result the D20 is not a suitable buy for those looking to capture photos of sports and action, wildlife or impatient children. The LCD screen is viewable at nearly all angles, and is wide enough to offer users a great scope for composing. Brightness is adjustable in the settings, but we found the factory default to be on par.